Nestled in the small highland bay of Paxanax, below the village of Santa Cruz La Laguna, our villa provides tranquility and stunning lakefront views of 3 unsurpassable sentinel volcanoes. •	3 double bedrooms (1 with Queen Bed, 2 with 2 twin beds). 1 bathroom with bathtub. •	Exterior stairs lead you to the Master bedroom with uninterrupted tree-top views of the lake and the volcanoes. •	enjoy paradise while you rock in the hammock to the rhythm of the waves. Although Aldous Huxley's comment that Lake Atitlan is the ''most beautiful lake in the world'' His actually words were: 'It is really too much of a good thing.' Come and judge for yourself, we will be delighted to host you! If you’re looking for a "different and authentic" vacation experience, Casa Paxanax is your perfect option. Located on the shores of famous Lake Atitlan. Santa Cruz is an authentic Mayan village, which is situated at the top of the hill, from where the house is located. Feel free and safe to walk around. If you are interested in Mayan culture, this is a must! There are several nearby bars/restaurants within walking distance to connect with other fellow travelers. In the village, get around by walking to any of the nearby restaurants/bars or retreat centers. Santa Cruz is a 15 minute boat-ride away from the main town of Panajachel, but situated close to several bars and restaurants for easy access to entertainment and meeting other fellow travelers. Otherwise, you can always take a boat to one of the nearby villages to explore the lake! •	The home is located a short boat ride away from Panajachel. The public boats run daily, leaving every half an hour from 6am to 6:30 pm (cost is 10-15Q ($1.50-$2.00 per person). •	You will need to park your car in Panajachel, by the dock Kayucos Marina private packing. The cost is Q75/night. •	Shuttle service or Uber is also another way to arrive from Antigua, Xela or the City. We can help you organize your shuttle. From Britain, but spent my entire adult life in Guatemala, working in the tourism industry. I am now living in the Twin Cities, and trained as an addiction counselor. Very much miss Guatemala, but Paola, our lovely House manager is onsite to help you with one of our rentals. Do give me a call.... I appreciate any opportunity to be able to talk about Guatemala...the land of eternal Spring. I bought this property in 2000, not expecting to live there, but to have the perfect retreat home for weekends. Circumstances changed, and we ended up living in this home for 5 years. Due to my studies, I rent the home out. If you love it half as much as we did living there, you will be happy! 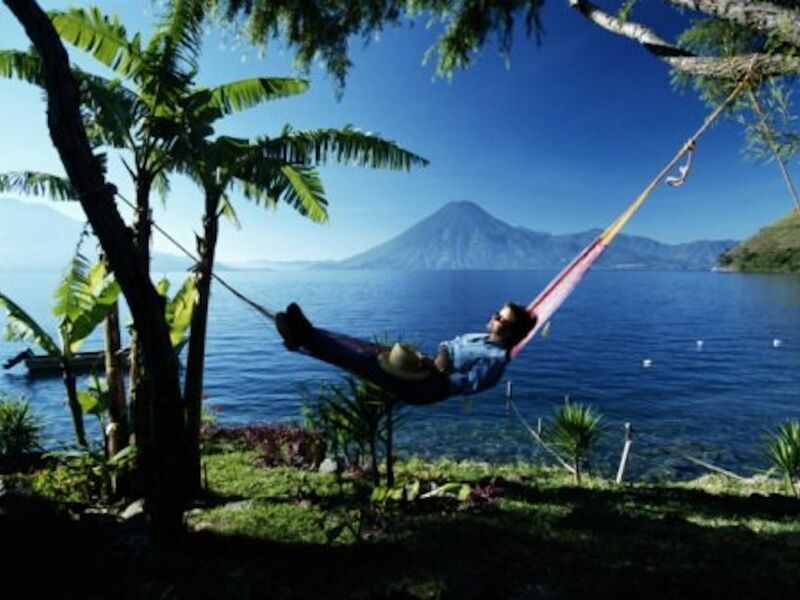 The house is situated right on the shores of Lake Atitlan, and is really very peaceful. Nearby, you will enjoy the benefits of a few local restaurants, where it is fun to meet fellow travelers! Volcano and Lake front views. The most spectacular I have ever seen. Located right on the shores of beautiful Lake Atitlan Views of the volcanos to die for! You are surrounded by Beautiful Mountains and Volcanoes. The lake is right there. Breathtaking! You need to park your car in Panajachel and get the boat to our home. The living room is an open plan design. You might chose to dine either on our large outdoor patio or inside around our island. I left my ecclectic mix of books for you to read. A pretty good selection. Enjoy! Rent kayaks from a local business. You will love this home, where I lived with my 2 children for 5 years. Secluded, and yet many fun places to visit (restaurants, bars, projects) within a few minutes walk. Great place to chill or become creative and to get to know a Mayan community and village. We were a group of six and we all fit comfortably. The house was clean and well decorated. We spent most of our time on the deck having beers and fighting for the hammock and taking in the view. We came in pretty late and only stayed one night but would all gladly stay for longer. Flor and Santos were very helpful. They left us the cutest welcome baskets and were very available if we needed anything. If you are looking for a quiet getaway on the lake, this is your house. Six of us arrived by boat after dark. It was quite an adventure pulling up the dock, but once we were on land we were truly in paradise. It is a smaller rustic dwelling, but the beauty is outside anyway. The sunrise from the dock, sunsets from the balcony, the hammock, the antique textiles are just a few of the great things about this house. We also walked along the trail to San Cruz where we found a great restaurant and lots of friendly locals. We highly recommend this house to adventure seekers and those looking for a quiet getaway. Not for luxury seekers. A beautiful place to stay for our girls trip! We stayed at Casa Paxanax for a week in October. The property is exactly as it appears on this profile. It's absolutely awesome! Plenty of room for the four of us. Flor was incredible with her assistance before and during our stay. Santos the caretaker is very kind, though he speaks almost no english so when in doubt text Flor and all communication is made 100% clear. We reached out to the neighboring property Villa Sumaya in advance of our stay and were able to book yoga classes, a hot tub, massage services and enjoy meals there during our stay at Casa Paxanax...and you can even pay them in american dollars! They were awesome too! I really can't say enough good things about this place. Thank you to everyone that manages it! We loved the lake and your home, we all had a great experience. Santos and Josefina are very helpful and beautiful people. The house was breathtaking and had great space. Awesome view of both volcanos (Atitlán and San Pedro). Spanish Classes can be arranged! High season rates apply for Christmas and New Year and Easter week. 20usd clean up fee NO DAMAGE DEPOSIT :) We work on a trust system.